The inspiration for The Last Alaskans-the eight-part documentary series on Animal PlanetHundreds of hardy people have tried to carve a living in the Alaskan bush, but few have succeeded as consistently as Heimo Korth. Originally from Wisconsin, Heimo traveled to the Arctic wilderness in his feverous twenties. 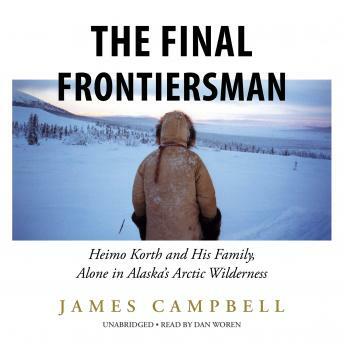 Now, more than four decades later, Heimo lives with his wife approximately 200 miles from civilization-a sustainable, nomadic life bounded by the migrating caribou, the dangers of swollen rivers, and by the very exigencies of daily existence.In The Final Frontiersman, Heimo's cousin James Campbell chronicles the Korth family's amazing experience, their adventures, and the tragedy that continues to shape their lives. With a deft voice and in spectacular, at times unimaginable detail, Campbell invites us into Heimo's heartland and home. The Korths wait patiently for a small plane to deliver their provisions, listen to distant chatter on the radio, and go sledding at forty-four degrees below zero-all the while cultivating the hard-learned survival skills that stand between them and a terrible fate.Awe-inspiring and memorable, The Final Frontiersman reads like a rustic version of the American Dream and reveals for the first time a life most of us have never imagined: amid encroaching environmental pressures, apart from the herd, and alone in a stunning wilderness that-for now-remains the final frontier. There is something compelling about Heimo Korth’sStory. I’d love to hire him to take me for a tour of the upper Coleen River. Bucket list!! !